When studying "latest use" I think it is important to distinguish between philatelists trying their luck with old stamps and regular postal use. At the top of the page, you can see a cover sent from KATERINOSLAV 11 5 21 to TALLINN EESTI (weak receiver cancel on reverse which appears to read 26 3 21, together with undated Katerinoslav Three Triangle censor mark). Underneath are Dr Seichter's original write-ups of this cover: "almost the latest known date on Ukrainian overprinted stamps". I am not impressed. This is almost certainly a philatelist's cover, whose name we would know if someone had not thought it wise to burn out his name from the cover (see bottom left - someone has also used biro and red ink on the back making this a thoroughly unattractive item). 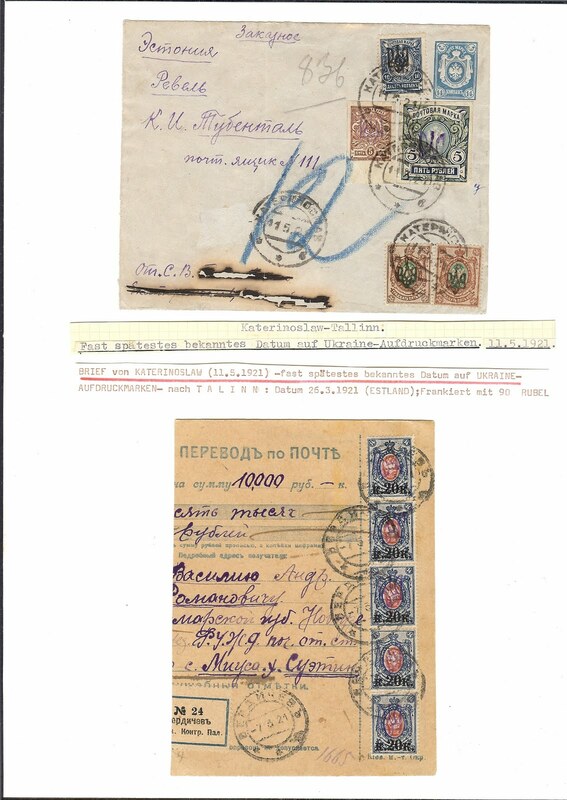 The franking is probably correct at 90 roubles: the 14 kopeck stationery stamp is disregarded, the 5 rouble imperforate Kyiv II (someone has written "g" beside it) is used at face, but the 5 kop imperf Kyiv II is revalued 100 times, as is the pair of 35 kopeck with Odesa Type II and the 10 kopeck with Odesa Type III. But this franking leaves me cold: I doubt these stamps came across the post office counter at Katerinoslav, even though this is apparently a Registered letter. The only interest is in the fact that the sender was able to get away with this franking. Compare the second item. This is a fragment of a Money Transfer order for 10 000 roubles sent from BERDICHEV 7 3 21 to MIUSS [Miusa] SAMAR 23 3 21 where it was signed for. It is franked with five 20/14 Kop with Kyiv II on the front and 5 on the back. These have each been revalued x 100 to give a correct 2% franking of 20 roubles. This fragment is to me much more interesting than the cover. The stamps were almost certainly at the Berdichev post office counter and were authorised for use. How about May 12, 1922? NOT my property: the Bob Taylor collection contains a registered letter from Odessa to Berlin, franked with a block of 40 of the 1k imperf Odessa II, used as stamps of 10,000R (or 1 1922 R) each. Regarding your cover posted on 11/5/1921 from Ekaterinoslav to Revel, I think the rate being paid by the Trident-overprinted stamps is the 20R international registered letter rate, then applicable in Soviet Russia and area. The two 35k stamps are superfluous - even if we count them, they would only amount to an additional 70k, as this value was not revalued to rubles. It appears that this cover has been recorded by Alexander Epstein in his article "More about the local tariff autonomies" in DZRP Nr. 94, April 2011 (see the ArGe Russland/UdSSR site), although not pictured there (see hia listing under registered letters, Ekaterinoslav province).